Described by many as resembling a scene from ‘A River Runs Through It‘, Stanford village possesses the idyllic, dreamy charm of an epic romantic film. Children fish from the jetties while Gymnogenes call nearby; residents hit the river with their canoes early in summer for a ‘country gym session’, while horse-riders saddle up for long out-rides in the mountains. One of the town’s recent and most beloved additions, which opened its doors only a few months ago, in early December, 2013, is Don Gelato – Stanford’s own authentic Italian gelato. Lionello Giovannetti, the passionate presence at Don Gelato, creates his own original flavoured gelato, made from only natural ingredients in imported Italian machines, the way that the best authentic ice-cream is made in Italy. You’ll have to elbow your way past customers on a hot day, when a craving for salted caramel, lichi and mango sorbet, cherry, apple pie or dark chocolate gelato seems to strike everyone at once! The House of Don Gelato also serves delectable breakfasts, strong Italian coffee and scrumptious lunches, so remember to stop by for the full experience. Graze, just next door to Don Gelato, is owned by Tabby Robertshaw and Alex Chouler and continues to delight out-of-towners and locals with their locally-sourced and organic ethos. Tabby and Alex originally planned to find a piece of land in the country to live out a dream of subsistence farming, but when the opportunity to buy Graze came along, they couldn’t resist. 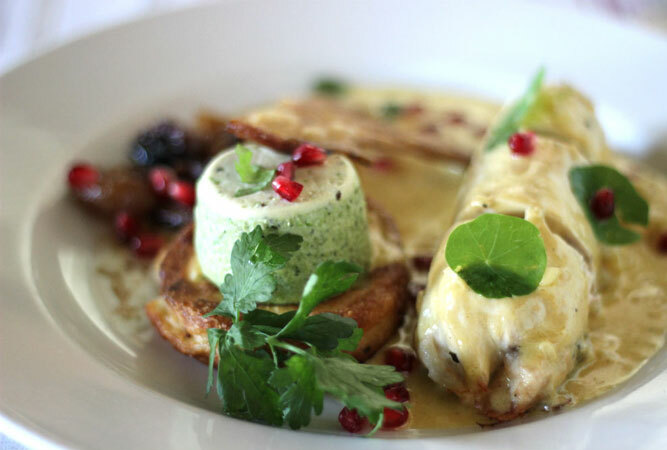 The small rustic Italian-influenced menu changes every weekend, often featuring dishes such as rabbit risotto, freshly foraged mushrooms, fresh fish and melt-in-your-mouth roasts. Graze also opens on a Wednesday morning especially to sell organic produce on their veranda, sourced both from their own garden and local organic farmers. Bring your basket along and collect the best veggies, fruit and bread you’ve ever tasted between a banting breakfast or freshly baked croissants. 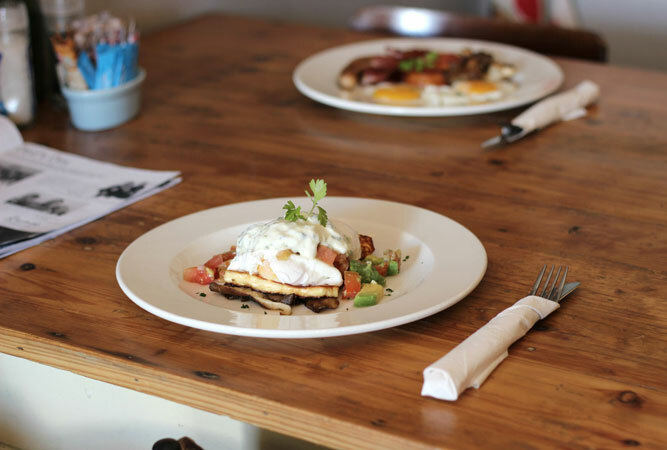 Multi award-winning Marianas still tops every serious foodie’s must-visit list, and judging from the throngs of patrons happily spilling out from their doors every afternoon after lunch, they are still proving themselves to be one of South Africa’s best country restaurants. Havercrofts, just outside the village, has been awarded No.1 on Tripadvisor status, and so of course I found myself there within hours of the announcement! Innes (rude wife!) and Brydon (good looking cook! ), have successfully cooked their way into everyone’s hearts over the years. It had been a long while since we’d visited and I wanted to kick myself for every lunch missed. We arrived at the atmospheric old homestead, which overlooks pastures filled with grazing sheep, greeted rambunctiously by owner and host, Innes Havercroft. Innes commanded the room like a seasoned mistress of ceremonies, resulting in much giggling from her patrons. The Devilled Kidneys I’d heard so much about arrived on my table, set atop the most delicious potato rosti I’d ever had. Innes continued to weave her magic, ensuring that the atmosphere felt something akin to a medieval banquet crossed with a gypsy dining wagon: I half expected her to whip out a deck of tarot cards and sing my fortune, with the backing of an accordion player. My Chicken Ballontine was the stuff of dreams, sprinkled with pomegranate seeds and complimented by a pea custard, while my son’s Roast Beef with Yorkshire Pudding was almost devoured before it reached his side of the table! By the time we’d finished our apple pie and home-made fudge ice-cream desserts, I felt stricken with an acute case of ‘vino callapso’ and luncheon horizontalis, but I managed to extricate myself in time. 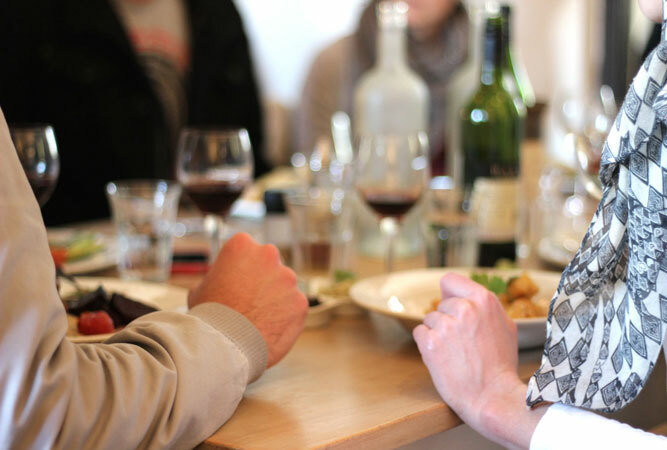 A few days later, I spent the day with friends at one of the Overberg’s most beloved new destinations, The Tasting Room at Stanford Hills. The award-winning wine flowed as we celebrated the rare beauty of a perfect day in June, on an otherwise ordinary Thursday. Chef Bridget served us our delectable mains: Gourmet Pap en Wors (grilled polenta with medium rare fillet) and Asian-style Pork Noodles, which we feasted on, interrupted only by gulps of Stanford Hill’s new Jackson Sauvignon Blanc (which tastes like rose petals and Turkish Delight). We were presented with a heart-shaped mezze board smothered with lovingly prepared pates, dips and preserves; cheese; fresh fruit; biltong and a few loaves of ciabatta for dipping. We tucked into our yummy titbits between longing gazes over the valley and the mountains; during the season when the canola fields burst into butter yellow blooms, the rolling fields shimmer in the distance. 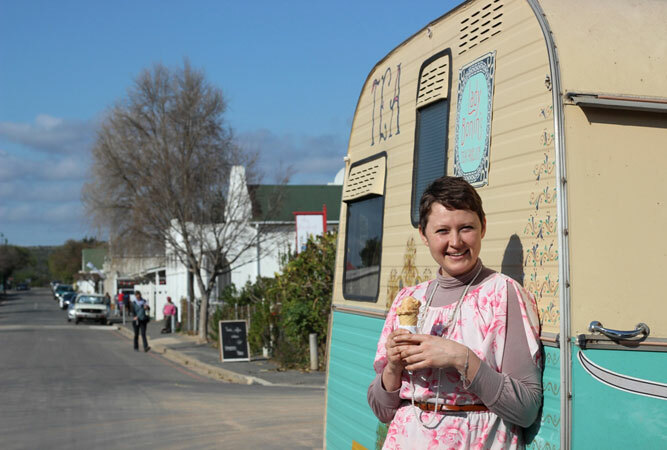 I made my way to the outskirts of Stanford the next day to experience Klein River Cheese’s new award-winning cheese, which was voted the Dairy Product of the Year, 2014. The small, family run dairy received 7 awards this year; including a Qualité award, and the most coveted honour of the SA Dairy Championships. I chose a few of my favourite goodies (Oak Smoked Stanford and Gruyere), ‘Erwin’s’ salami (a local artisan meat purveyor), a bottle of delicious Stanford wine and some picnic basket fillers for a little moveable feast out on the river bank. One thing you may have gleaned from my article is that Stanford is definitely best enjoyed when hungry and thirsty! Yes, it’s gorgeously quaint; yes, children love it; and yes, it’s the perfect country escape only one and a half hours from Cape Town. 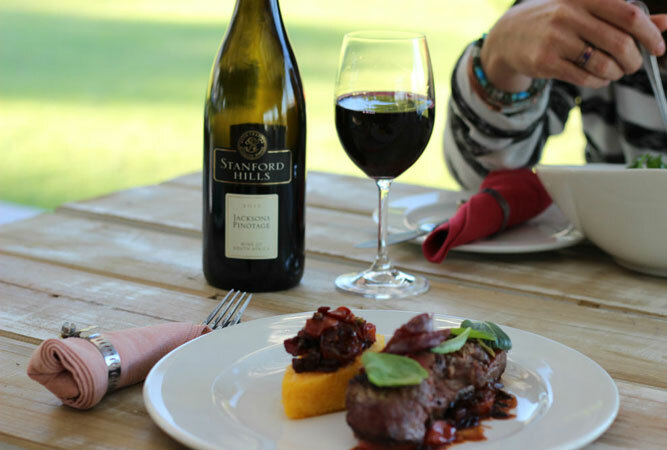 But it is also an adventure of the culinary variety, with its own mini wine route (Sir Robert Stanford Estate, Stanford Hills and Raka) to boot. 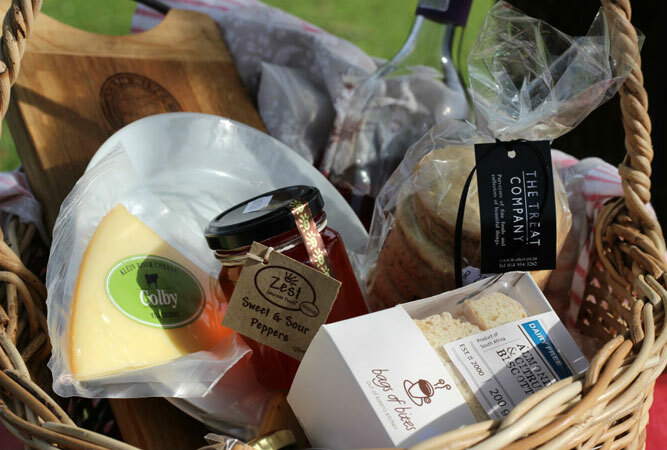 Cheese, scrummy lunches, rich puddings, gelato and fruit of the vine? Sounds like taste bud heaven to me. Book your Stay in Stanford now! There are many excellent guest houses and self catering establishments waiting to welcome you to this splendid village in the Overberg!